Joe Rocket Phoenix Gloves Review – Is The Value There? The Joe Rocket Phoenix Gloves are a low cost motorcycle glove that look good! They’re very popular and a lot of people have a hard time choosing between these and some of Joe Rocket’s other great options. The Phoenix Gloves come in a crazy wide selection of colors. Too often motorcycle gloves only come in plain black so it’s really refreshing to see such a variety of colors available. Yellow, black and silver is definitely my favorite as my favorite soccer team play in yellow and black. A first glance the Phoenix Gloves are a genuinely good looking pair of gloves. For the price of the gloves they look much higher quality than the price suggests which is always nice. At first glance the Joe Rocket Phoenix Gloves are incredible value for money. Comfort and dexterity are something that the Phoenix gloves don’t lack in the slightest. Some summer gloves sacrifice protection, versatility and style in order to keep your hands cool but this isn’t the case with the Phoenix gloves. The gloves feature what Joe Rocket call their Free air mesh shell which ensures that your hands will remain at a comfortable temperature during the hot summer months. An additional cooling feature is that the glove’s cuff is breathable and made of a wicking material to ensure that any moisture build up is swiftly removed. This ensures that while you’re wearing the Joe Rocket Phoenix Gloves your hands will remain comfortable throughout. In addition to this the Phoenix gloves are relatively thin meaning that movement is not restricted in any way, making them perfect for motorcycling. The Joe Rocket Phoenix Gloves are summer specific motorcycling gloves meaning that heat retention isn’t important but instead it is very important for the gloves to be able to keep your hands at a comfortable temperature. If you’re looking for a really warm pair of motorcycle gloves or even heated gloves you should read my review of the Venture Carbon. This ensures that while you’re wearing the Joe Rocket Phoenix Gloves your hands will remain comfortable. I used these gloves in the middle of summer so if the cooling system wasn’t good enough at removing heat from the gloves, my hands would have been unbearably hot but this wasn’t the case at all. The Phoenix Gloves kept my hands at a perfect temperature, making them a pleasure to wear. Unfortunately the Joe Rocket Phoenix Gloves aren’t waterproof which means that riding with the gloves during rainy conditions won’t be a very good idea. For a totally waterproof motorcycle glove check out my review of the Venture Grand Touring gloves. Thankfully the Phoenix gloves aren’t intended for use in wet conditions. They are only intended to be used strictly in hot, summer conditions. However regardless of this it would have been nice if the gloves could have been waterproof but this isn’t something we should hold against the Phoenix Gloves, especially considering the price. 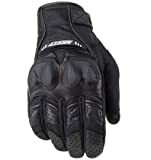 Debatably the most important category for motorcycle gloves the Joe Rocket Phoenix Gloves performs fairly averagely. The Phoenix Gloves sport leather reinforcements in areas of the gloves that are perceived to be naturally weak areas of the gloves however some people online have said that this system doesn’t work at all and in fact the gloves are very prone to ripping after an extended but not unreasonable period of use. This is quite worrying because although the Phoenix gloves are a budget pair of gloves you still hope to get good value for money. The Joe Rocket Phoenix Gloves also have an injection molded split knuckle design which will help to protect the knuckles if you have an accident. This part of the gloves does feel pretty sturdy and although much of the gloves has come under criticism I’d be confident in saying the knuckle protection is good enough. The final point on safety is that the gloves have high density padding in specific areas of the glove, in particular: the knuckles as well as a padded and reinforced thumb for additional protection. Overall the Joe Rocket Phoenix Gloves are good value for the money but not as good as some higher end gloves. I really like the way they look and that they are available in such a wide variety of colors but when it comes down to the performance of the gloves themselves they’re probably not going to last more than 2 years. They are pretty decent value for money and they look and feel great but they’re just not super durable. They’re also good at keeping your hands at a comfortable temperature, the safety features are nothing special but they’re satisfactory. The real disappointing downside to the gloves is that they’re not built to stand the test of time. This isn’t always a bad thing though because if you’re like me, you enjoy getting new gloves every once in a while because it’s fun to try new stuff and change your look a bit too. All in all, these Joe Rocket Phoenix Gloves are a good buy.